HC-OE120-4/8EV is a fiber optical transmission device. 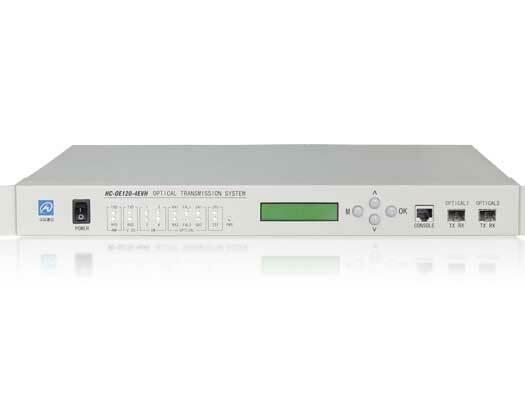 It works as the PDH, and can be used to relay data of local networks or point to point station switch or subscriber switch. It also is widely used to connect the Wireless Base Station, Ethernet and conference TV. HC-OE120-4/08EV can transparently transmit 4/8 channels E1 or 3/7 channels E1 + 1 channel V.35 data (can be set by DIP switch). It has optical port 1+1 protection function and supports three kinds of control mode which are LCD+Keypad, GUI network management software (based on serial port) and CLI. Especially, it adopts SFP optical module to make it easier to hot-swap optical module.